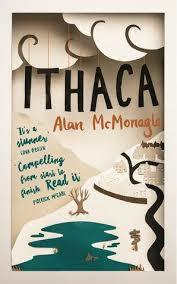 BleachHouseLibrary.ie: Book Review - 'Ithaca' by Alan McMonagle. Eleven-year-old Jason spends most of his summer days avoiding his drunk mother and trying to find out who his father is. His curiosity is limited by geography, so he takes his research to the local pub, shops and streets of his small town. A host of characters have plenty to say about the recession, builders, chancers and even his own mother. Jason escapes to the peaceful surroundings of the swamp where, amongst the murky waters and tree stumps, he discusses Greek legends and pictures lands far away with his only friend. They soon find themselves planning real adventures and are determined to make their mark. "It was my first time in the pub, a dark dungeon of a room with a beery smell and no windows.[...] Shirley Halligan was behind the counter pulling drink. Meantime, Barry the bank clerk was sitting at the low table by the wall, in his stripey suit and pink shirt and long shoes, the kind that went on long after feet end, and the wondering head on him because his mobile phone wasn't working." McMonagle's writing brings a whole village to life with simple yet effective words. The story flows at a steady pace, with Jason at the heart of it. He is a victim of circumstance; finding solace in self-harm and vandalism; always listening and hoping for clues leading to his father. Jacinta is darkly comical, despite her situation. She has a litany of excuses for her dire financial situation and most involve Jason suffering from life-threatening illnesses. "Look who it is, Shirley said, without even turning to me. You'll get a crick in your neck staring up like that, Shirley. Don't be smart. It doesn't suit you. You were in a much better mood the last time I was in. I'm a woman, kid. My mood changes a million times every second." Despite the bitterness spewing forth from Jacinta and the silent sadness which gnaws away at Jason, their story hypnotizes and jars, through lighter moments and visceral dark comedy. Mother and son get under your skin from the opening page. They crawl so far into your pores that you can almost feel the itch underneath. A remarkable and enthralling debut. Highly recommended. *I received an ARC copy of this title, from the publisher, in return for an honest review.